My own interest in bonds and shares began while I was working in international banking in the 1970s, when the world was a ‘simpler’ place and debts were less than today. Banks were keen to lend money to governments, whatever their colour, and to fund individuals with smart ideas – some too smart – and many of today’s financial crises are, pitifully, a reflection of what has happened before. If nothing else, I can only hope that this history will help today’s financiers to be a little more circumspect as to where they place their trust. 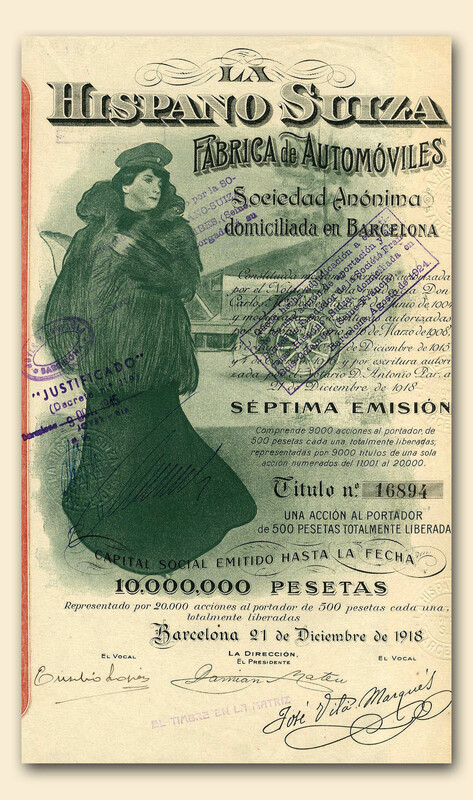 This is the third book I have written about the collecting of old bonds and share certificates (‘scripophily’). But this time the aim is to approach the subject more broadly, focusing on the purposes for the funds raised and how those purposes affected our lives both then and now. Indeed, there is no area of our material lives not touched by the raising of money. Sometimes funds were raised to fund government projects; other times, to fund wars and then again by entrepreneurs simply to finance their inventions. Often the only reminder is a certificate which may be colourful, exotic and representative of the time – and occasionally, rare. Many readers may be unfamiliar with bonds and shares, so it might be worth providing some explanation. Shares (also known as ‘stocks’), represent ownership, and are more generally understood, with many readers holding some of the recent variety in their investment portfolios. But ‘bonds’ are perhaps a little more effete. Put simply, a bond issue is a form of borrowing by a government or company. The key differentiators from share certificates is that the owner is often not identified on the document (the bond is then known as ‘bearer’) and the number issued is a known fact, as is the number paid off (‘redeemed’). Thus, rarity raises its head. In the past such things were only available in paper form but nowadays with the entrenchment of computers, they are often little more than an electronic record. Our interest lies with the paper documents of old. Because of their nature, bonds would normally expect to be issued to raise money and, ultimately, to be paid off. It may be surprising, therefore, to realise that many early examples still exist today. Some of these are due to default, some are simply cancelled and others are specimens. Country defaults are a key source of material acting as historical markers: thus the Chinese default of 1938 following the emergence of Mao Tse Tung; the Russian default of 1917 due to the Revolution; the Confederate States of America cessation of payments in 1865 as a result of the Civil War and the numerous defaults which have plagued South America since 1820. The bonds themselves are often engraved to the highest standards to deter forgers and were promoted in the world’s stock exchanges. The well-known banknote engravers such as Waterlow, Bradbury Wilkinson and the American Banknote Company were key printers. Confederate Bond (B260) depicting the Richmond Customs House, built in 1858. Once Richmond had been selected as the capital of the Confederate States of America, the building housed offices for Jefferson Davis and the Treasury. Ironically, it became the courthouse where Davis was eventually indicted for treason. So what were these huge sums of money used for? Prior to the 18th century, funds tended to be limited to trading ventures, such as the East India Company, but more recent focus has been placed on balance of payments, wars, or the creation of national infrastructures. It is interesting to see how foreign money played such a key role in the development (or plunder) of so many countries such as China. Communications were slow and information scrappy – thus many investors were lured into investments based solely on promised high returns. The collapse of China and Russia, in particular, taught many a lesson. 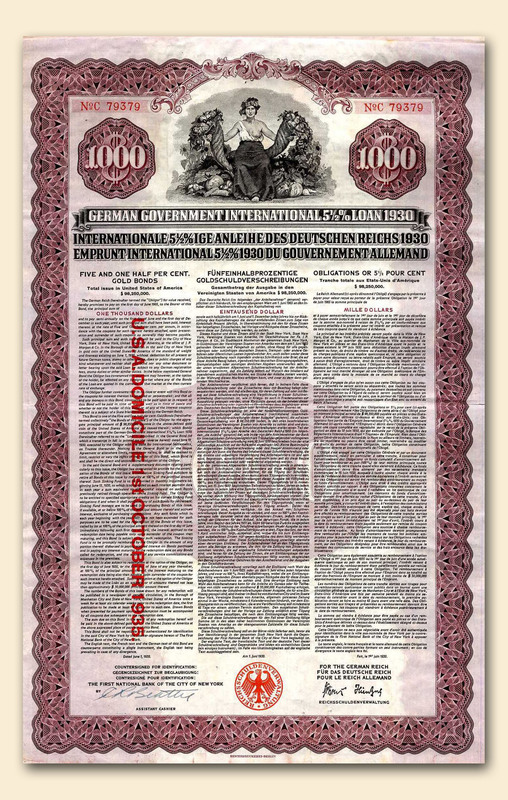 Not all investment opportunities were so far in the past; thus, for example, the financial collapse of Germany in the late 1920s resulted in the emergence of many foreign bonds often issued by the United States to help re-build the country. Other ventures, such as the failed attempt by Scotland to colonize the country of Darien (South America) resulted in the formation of the Union in 1707. 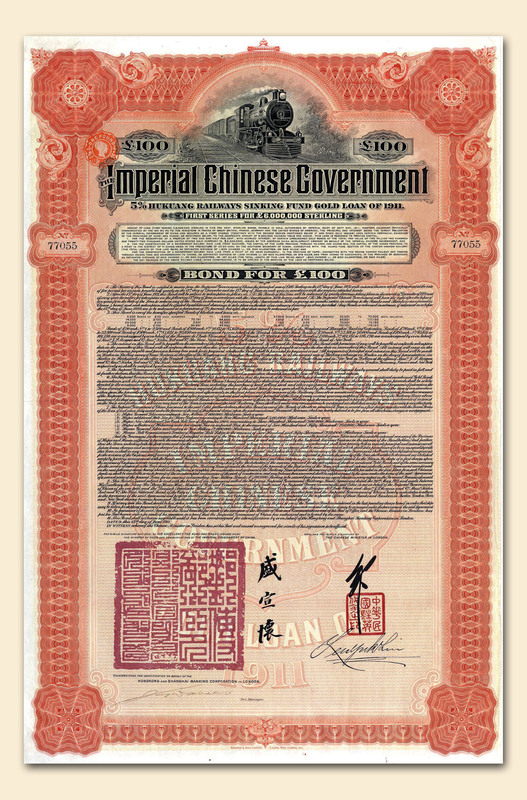 $1000 bond issued in 1930 (the “Young Loan”). Not all investment was initiated by governments. Much was triggered by the natural desire of the individual. The Industrial Revolution sparked the urge for progress initially triggering investments in canals and later railways. Following Stephenson’s successes with the Stockton and Darlington and the Liverpool and Manchester lines, the world opened up to rampant railway mania. Huge funds were employed in their construction and indeed much of the money raised by China and Russia was used for their development. As with all booms, a bust ensued but this was soon addressed and construction resumed. Railway construction in the United States flourished and from the first successful passenger line between Baltimore and Ohio, some 9,000 privately financed lines emerged. Needless to say, their construction was not without argument and frequent fights. However, finance was not limited to developing the railways; mining too was a major target, particularly with the discovery of gold in California and later, Australia. Miners flocked to the mining areas intent on making their fortunes; and money was raised on the world’s major stock markets, as well as the temporary markets set up in the mining areas themselves, such as the Rand in South Africa. Gold turned to diamonds, then tin, then nickel and later, oil and energy – all provided a source of wealth and adventure. 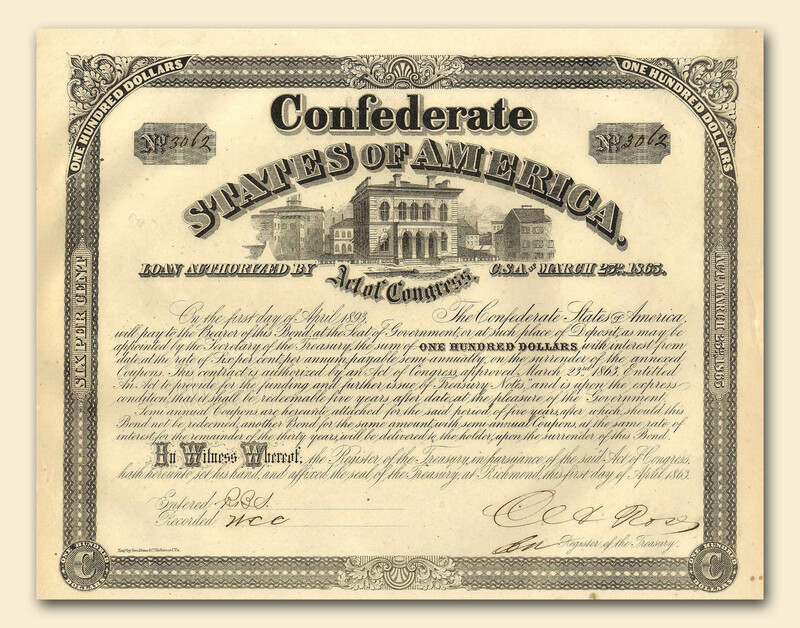 And all provide today’s collector with a wealth of share certificates to build a collection. 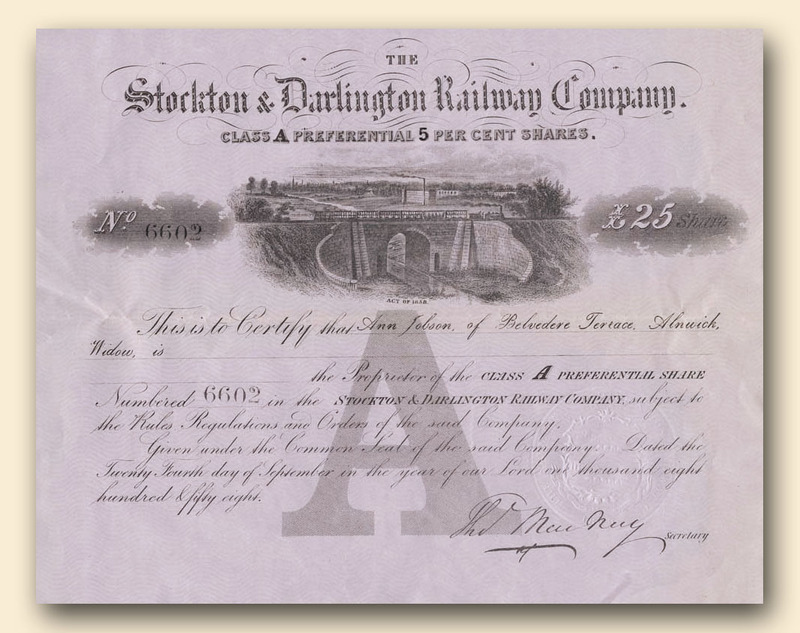 Opened in 1825 the Stockton and Darlington was the world’s first commercial steam railway. The preference share was issued in 1858. 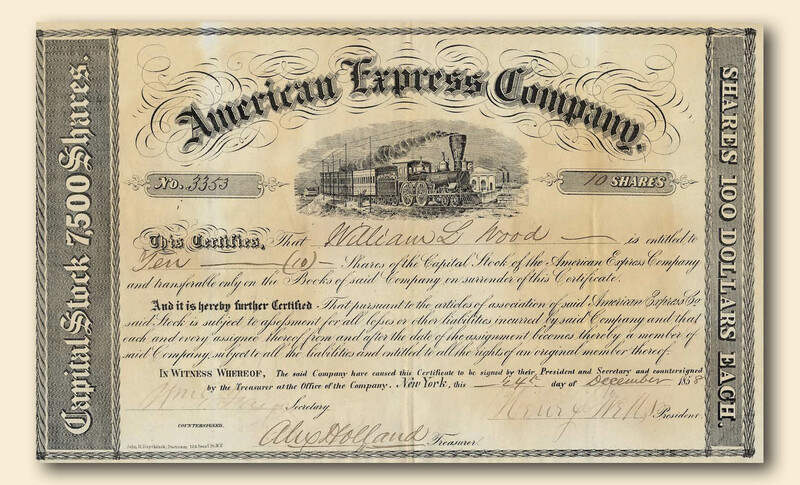 Early American Express Company certificate dated 1858 and hand signed by Wells, Fargo and Holland. So who were the ‘names’ associated with this boom in industry and mining? Many feature on the share certificates we can find today. To name but a few: Thomas Edison, Wells and Fargo, George Hudson, Cornelius Vanderbilt and E H Harriman. Just as these entrepreneurs forged the frontiers of industry so the ‘money men’ made it possible. Such notables as J P Morgan, the Rothschilds, John D Rockefeller and the Barings figure highly in this history. Inevitably, any book about money cannot avoid including some reference to the fraudsters and criminals attracted to the subject. Their stories are equally enthralling and it is probably fairly true to say that their initial objectives were honourable but once greed had taken a hold, disaster struck – and it often struck innocent investors. In recent years we have heard much about Ponzi schemes, thanks to the activities of Bernie Madoff, but the concept is not a new one and goes back to at least 1919 when the eponymous Mr Ponzi gave his name to the fraud. Put simply, the ‘scheme’ involves new money being raised to pay returns to existing investors when the actual business is unable to justify dividends. All is fi ne until the music stops and no new money can be raised. Kreuger & Toll is one of the earliest such schemes. At one time the company funded governments on the back of its match business but when funds dried up, disaster struck (!) and Mr Kreuger shot himself rather than face legal action. 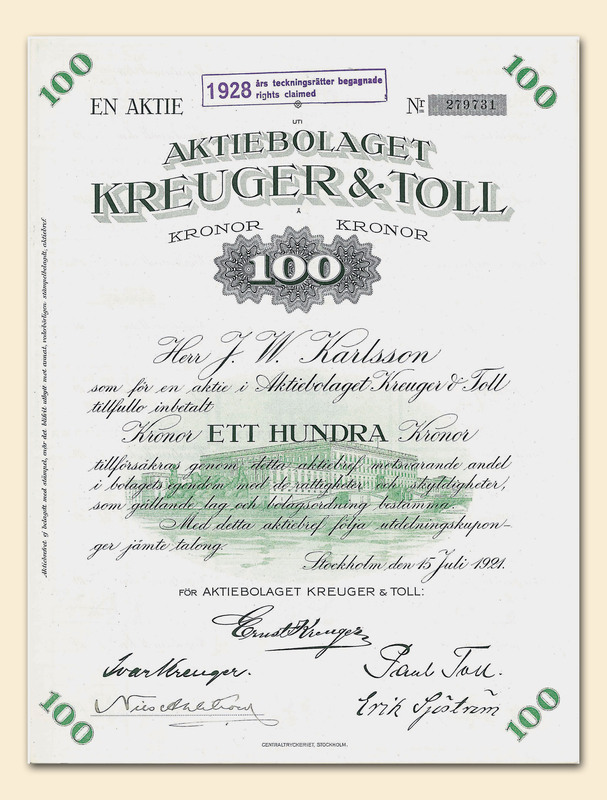 Share certificate dated 1921 and hand signed by both Kreuger and Toll. It was quite normal for Swedish companies to have their share certificates signed (rather than printed) by two if its directors. Original signatures of the key protagonists are rare. Other characters included in the book are Alfred Lowenstein, who mysteriously disappeared from a plane over the English Channel, Whittaker Wright, who on being sentenced took cyanide and Baron Grant, who, at his peak, was worth £20 million but died a bankrupt. Several have already been mentioned, such as mining, railways, fraud and government but there are many others, for example automobiles, canals, shipping and aircraft. The subject is almost endless and in that sense it makes an ideal hobby, particularly if you have a personal or professional interest in finance. Unlike other collectables, the items can be framed or kept in an album and many can be picked up inexpensively. This book is aimed at those who may be unfamiliar with the subject as well as the long-term collector. It aims to provide background and encourage the enthusiast to seek out their own histories. There is a story attached to every item – it just needs a bit of research. Hispano Suiza, best known for high quality cars, was favored by European royalty and also had soe of the finest “Art Nouveau” styled share certificates of the time. This example, dated 1918 was designed by the Spanish artist Ramon Casa I Carbo and depicts the Italian actress, Teresa Mariani next to her pride and joy. Financing the World by Keith Hollender “Old bond and share certificates have aesthetic appeal, a fascinating history, and investment value. Whether you buy this beautiful book for education or entertainment, you’ll be sorely tempted to start your own collection of stock certificates.” Professor Elroy Dimson, Cambridge University and London Business School. Co-author of Triumph of the Optimists. 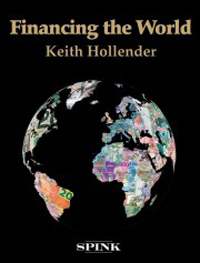 Financing the World is published by Spink at £25.00. You can go to the Spink website www.spinkbooks.com to order your copy.